Custom designed husband and wife partners desk. We turned a little used sitting/guest room into a fully functioning state of the art home office. Constructed from cherry cut from the client's land, the opposite wall features a custom fly tying desk. 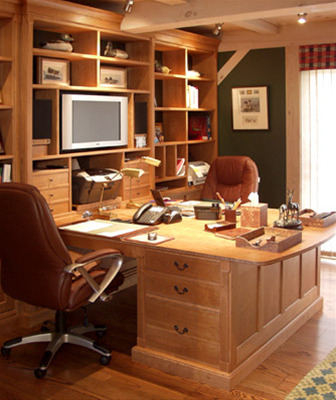 The room won first place in the Vermont Wood Products Manufacturers annual design competition in 2006.